The Ocicat cat is a domestic cat breed, developed or should we say 'created' by cat breeders to emulate spotted wild cats. No wild cats were used to develop this beautiful spotted cat. This cat owes its existence to an experimental breeding program! 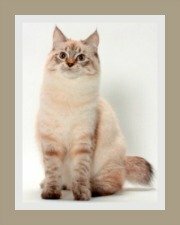 In 1964 Virginia Daly, a cat breeder from Michigan USA, used a hybrid female (an Abyssinian/Seal Point Siamese cross) and a Chocolate Point Siamese cat to produce a Tabby Point Siamese. The offspring of this union produced a litter of kittens, one in particular, had a beautiful ivory coat with gold spots. Despite his beauty, Dalai Tonga did not meet the criteria of the breeding program and was neutered and sold as a pet. It did not end here! Mrs Daly's interest in spotted cats grew when she received further inspiration from the geneticist Dr Keeler who encouraged her to renew her breeding program to emulate spotted wild cats. 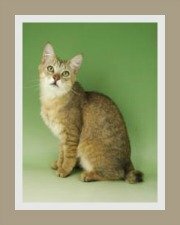 Using the original cats, a hybrid female ( Abyssinian/Seal Point Siamese cross) and a Chocolate Point Siamese she created foundation cats for this experimental breeding program. 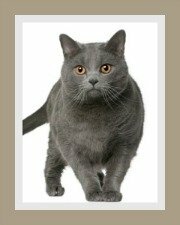 To ensure size, eliminate the typical oriental elongated look and to provide the range of silver color, she used American Shorthairs as outcrosses. 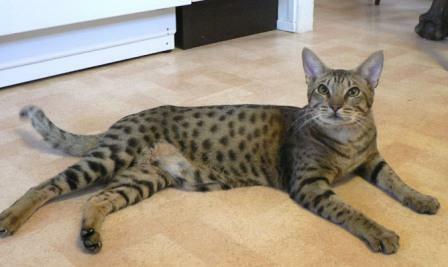 This cat breed has absolutely no 'wild blood', but the intention is that is should emulate a wild spotted cat. Various cat breeds were used by breeders to achieve the current body type. The Ocicat cat holds the distinction of being the first 'man-made' spotted cat to receive recognition. The California Spangled followed shortly after, but it would appear that breeding of this cat has been abandoned. What about the name you may ask? Mrs Daly's daughter derived its name from the Ocelot (wild spotted cat) and 'cat'. 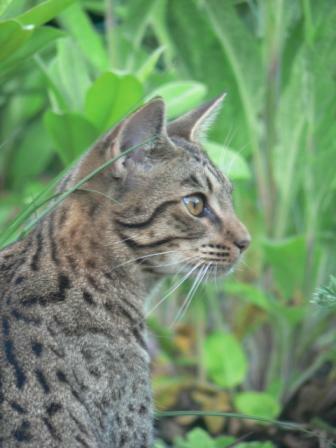 The Ocicat cat finally received recognition from the CFA in 1986 and TICA 1988 and the first cats were exported to France around 1989. This is an athletic, well muscled, well boned solidly built cat. It is described as a moderately large, lithe and graceful cat. It is a powerful cat, not cobby by any manner, it's not a lightweight, in fact it is quite heavy for its size. To compliment the body, the legs are powerful, well muscled and medium long. The Ocicat's tail is fairly long and relatively slim. The Ocicat's head could be described as been slightly triangular with rounded contours, a robust chin, broad muzzle and a firm jaw. (Older males may have jowls). Their eyes are large and almond shaped and tend to slant upwards towards the ears. The eyes can be any color except for blue. The Ocicat's alert ears are moderately large and lynx-tipped ears are desirable. The coat is satiny, short and smooth in texture and has a glistening sheen. Although the hair is short, the length does accommodate several bands of color, thereby giving the coat a ticked appearance. The short, close-lying fur gives the cat a very sleek look and shows off their rippling muscles beautifully. The coat is described as agouti spotted. Agouti means that every hair is characterized by alternate bands of dark and light color. Spotting on the coat must be well and clearly defined and show good contrast to the ground color (i.e. the background color). 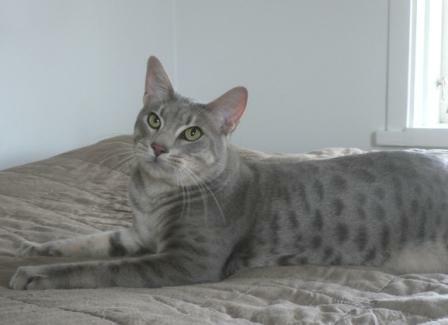 The Ocicat cat comes in a wide range of colors e.g. chocolate, fawn, tawny, lavender and many more. Some other defining features would be the 'M' tabby marking on the forehead and mascara markings that encircles the eyes. They make ideal pets for young and old. Most de-sexed cats get on well with other cats. Cats and dogs get on well provided it is a cat-friendly dog. They do not enjoy solitude and would do best in a household where there are either other pets or human companionship. Like most cats the love a combination of indoor / outdoor living. We need to stress that outdoor means an enclosure or an escape-proof garden. 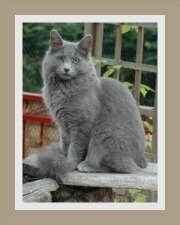 This active, athletic cat is described by many breeders as outgoing, friendly and sociable. Whilst the Ocicat cat has a wild-look, it is most certainly not aggressive. It has a predictable temperament and is devoted to its owner. It is lively, playful and curious, yet a gentle and affectionate cat. It is not demanding and has a soft voice. It requires very little grooming and is a low-maintenance cat. To keep the coat in good condition, it is advisable that they be brushed at least once a week. 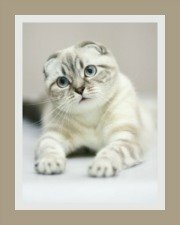 Our cat care pages provide excellent and comprehensive grooming tips for claws, eyes, teeth and hair. 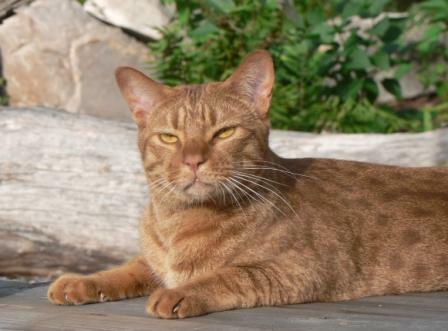 The Ocicat cat is a healthy and robust cat, with no known hereditary or genetic conditions. Please do vaccinate your cat against the common infectious feline diseases. Access to a clean and fresh water supply and a well balanced diet is all your kitty needs. 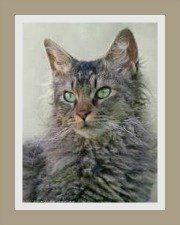 Our cat food information guide will assist you in choosing the best diet for your cat. The life span of this spotted cat is between 9 - 15 years which is considered a medium to long life expectancy. Cats that live indoors, are vaccinated and receive a healthy diet and exercise live longer than those that do not.